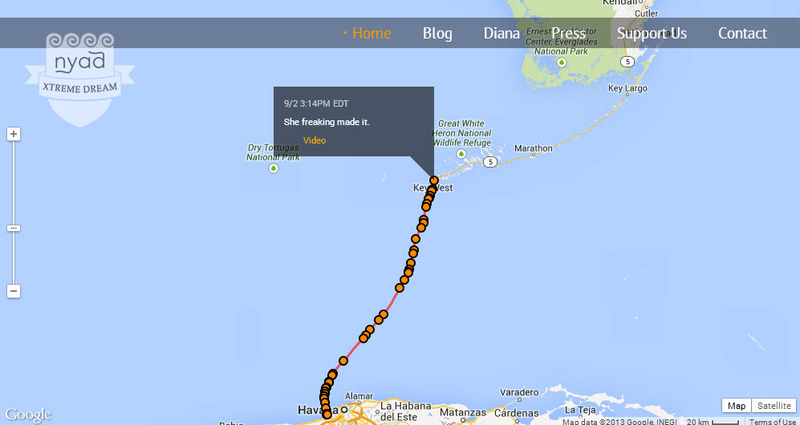 Endurance swimmer Diana Nyad was forced today to end her fourth attempt to swim unassisted (no shark cage) from Cuba to Florida, which she began on August 18. This journey of just over 100 miles was expected to take her more than 60 hours. 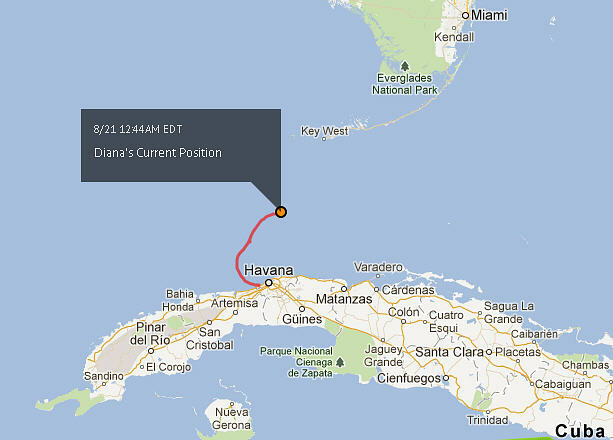 Diana Nyad’s last position this morning, from her website. Swimming from Havana to the Florida Keys has been something of an obsession for Nyad for decades. Her first try at crossing the Florida Straits was with a shark cage in 1978, but she was unsuccessful. She made her first attempt at an unassisted crossing on August 7, 2011. After swimming for 29 hours, she was turned back by ocean currents and winds pushing her off course, shoulder pain, and jellyfish stings that triggered her asthma. 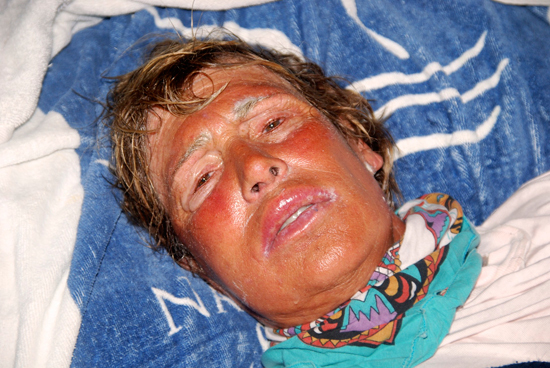 She tried again in September 2011 and was again foiled by jellyfish stings after 40 hours in the water. The day before she started this fourth try, she said “I’m feeling tremendous inner pressure that this has got to be it, this has got to be the last time.” (source) “There’s a reason no-one’s ever done it, but I’m prepared. … I may suffer some, but I’m prepared for that, too.” (source) And suffer she did on every try: from sunburn, asthma, swelling of her lips and tongue, hypothermia, circling sharks, exhaustion, muscle and joint pain, and of course, jellyfish. Her motivation for making this epic quest is not only for her own glory. I have to admire this woman and her dedication to what some (including, ahem, me) might say is a foolish, egotistical, dangerous, and wastefully expensive attempt to do something that doesn’t even need to be done by anyone, ever. I admire that she was and is willing to accept a tremendous amount of physical hardship and risk to pursue something she feels is worthwhile. She is without question strong, brave and dedicated, and cannot be personally faulted for being unable to complete the crossing. The Straits seemed intent upon slamming the door in her face, as they have done to nearly every single swimmer who has ever headed north from Havana trying to reach the Keys. Diana Nyad inspires me to dream what she calls the Xtreme Dream. She will never be forgotten for what she has attempted to do. Even older women can make history when they dare to dream big, and that is the victory that Nyad has snatched from the jaws of defeat.